A sumptuous feast for the individual food lover or for an entire crowd! No detail is overlooked when we hand-pack a large picnic hamper with delectable goodies. A wonderful gift for those with impeccable taste. 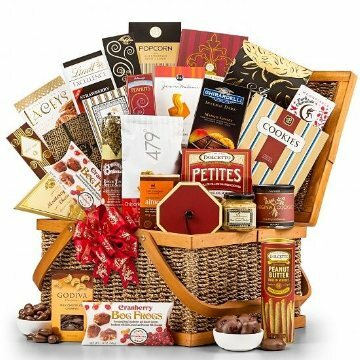 This gift basket includes the following: Caramel Almond Popcorn 4 oz, Aaron Bell Pretzels 4 oz, Premium Coffee Blend 1.5 oz, Macadams' Chocolate Chip Cookies 4 oz, Toffee Peanuts 2 oz, Jumbo Peanuts 4.9 oz, Unsalted. Macadams' Island Mix 2 oz, Pacific Gold Pistachios 2 oz, Dolcetto Chocolate Wafers 5 oz, WVM Sweet Hot Stone Ground Mustard 3.25 oz, Sun Dried Tomato Pesto Cheese Biscuits 1.5 oz, Biscotti 1.62 oz, 479 Degree Chipotle Caramel + Almonds 10 oz, Dolcetto Peanut Butter Wafers 3 oz, Original Cheese Straws 2.5 oz, Grilled Artichoke Antipasti 7.9 oz, Premium Version, Auberge Brie Cheese Spread 3.75 oz, Cheese Spreader, Saraivanov Smoked Salmon 4 oz, Aaron Bell Crackers 1.5 oz, Candy Berries 2 oz, California Strawberry Champagne Sauce 8 oz, Raspberry Tea Cookies 3 oz, Roasted Almonds 1.5 oz, Mudpuppies 1 oz, Cocoa 1.25 oz. Items are packaged in a lovely classic picnic hamper. Measures 18" x 13" x 9".